If the Master’s degree is the new Bachelor’s, is the doctorate now the new Master's? The US Census Bureau can tell us a thing or two about how the American and European populations are aging – the proportion of those older than 50 continues to outpace that of those younger than 50. Indeed, the number of US residents 65 and over is projected to double by 2060. AARP president JoAnn Jenkins has suggested that we need to “disrupt aging” – to rethink what getting older means and to dispel the many received ideas we have. With rising percentage of Americans living longer than previous generations, their working lives are longer as well. Their educational attainment has also risen, as they pick up a new diploma or two later in life. Paradoxically, a number of reports on the US education sector have revealed a stagnation or even decline in the number of MBA programs, with several renowned schools discontinuing full-time two-year programs. This is in part due to a crisis of college affordability in the United States. With increased mobility, a rising number of American students, young and old, are considering countries with lower tuition rates. For those interested in obtaining an MBA, this has led to a thriving sector in other parts of the world, as well as alternatives such as the MIM (Master’s in International Management) and Professional Science Master’s. According to the 2015 US Census 32% of US residents hold at least a bachelor’s degree, 9% a master’s degree, and 2% a doctorate. This increase in people boosting their educational qualifications has resulted in a kind of “credential one-upsmanship”. If the master’s degree has been called the “new bachelor’s”, then a mere bachelor’s degree may be devolving into the equivalent of a high-school diploma. 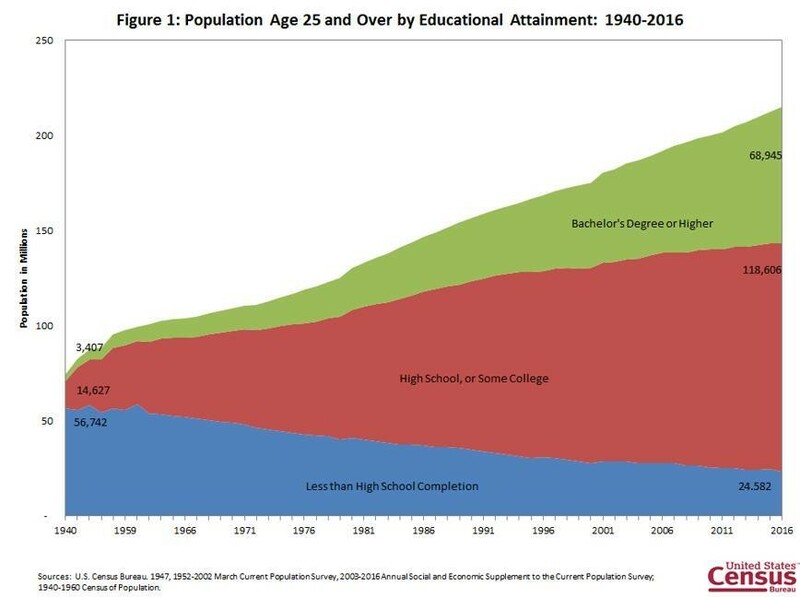 With the rise in the number of Americans over 60 remaining in the workforce and those holding master’s degrees, it seems safe to say that the demand for doctoral qualifications for older students will increase as well. This trend will in turn put new pressures on universities to design part-time alternatives for professionals, rather than the traditional Ph.D. programs that require 4 to 6 years of full-time commitment. Country case studies show the need to design professional doctorates to meet this growing demand. A 2016 study in the United Kingdom indicated that professional doctoral programs are on the rise in fields like engineering, psychology, education, medicine and business administration. As the program director of a Doctor’s of Business Administration (DBA) in France’s Grenoble Ecole de Management, I have witnessed first-hand the growing demand from the United States, with an increasing number of highly qualified candidates from a range of backgrounds. The DBA is part-time program that trains executives and professionals in research methodology for the social and management sciences, and enables those seeking new challenges the possibility of reaching the upper echelons of learning while continuing to meet professional and familial obligations. Many of our candidates and graduates evoke an existential “quest for meaning” after years of corporate service, or the desire for an “Act 2” that would allow them to move toward a career in academia or consulting. For them, the doctorate can be the ultimate item on life’s “bucket list”, where professional identity and a personal narrative converge. However, many programs can push professional doctoral candidates toward the same playing field as PhDs looking for tenure-track positions in the ever-competitive academic job market. Instead of moving the professional doctoral candidates towards topics rooted in practice and leveraging their life experience, academic supervisors and employers – alongside peer-reviewed publications, conferences, and hiring committees – push them toward making theoretical contributions. As indicated in a recent article by Valérie Sabatier, Mark Smith and Michel Albouy, also with the Grenoble Ecole de Management, such hide-bound approaches can result in less innovative, more conservative thesis topics and subsequent publications. Yet PhD graduate programs have been critiqued for flooding the market with ill-prepared, inexperienced candidates. Navigating the currents flowing between theory and practice while overseeing the tricky relationship between supervisors and students means that doctoral programs, whether targeted at younger or older students, have their work cut out for them. Brain drain – from the United States to Europe? As supply-side economics would have it, the number of doctoral candidates is growing because the number of Ph.D. programs is on the rise. It follows that the more doctoral candidates there are on the market, the more aspiring researchers will flock toward good programs. While online-only DBA programs are promoted as being more cost- and time-effective, it seems neither possible nor desirable to train individuals 100% remotely for a career in which rhetorical skill, debate and critique, and peer review are required on a daily basis. While I’m far from a neo-luddite, it seems that replacing the physical presence of the analogue with the remoteness of the digital is next to impossible when it comes to the development of high-quality, original ideas. What is required to foster innovative research proposals is good old fashioned face-to-face discussion and debate of one’s with peers and mentors. It seems that many Americans interested in late-in-life doctoral degrees agree, judging from growing demand for professional programs such as Grenoble’s DBA, where 100% of the teaching is face-to-face and where students are trained to iteratively “socialize” their research. Add to that the fact that European programs are dramatically more affordable than many US options, we expect that a steady stream of highly qualified Americans looking for their “Act 2” will continue to grace our hallways in the future.